Just as I hoped, the Easter weekend proved successful for some, with plenty of Mackerel, Pollock and Wrasse showing. There was also a good number of Plaice caught, but they were very patchy. Chances were if you caught one you caught several. It is certainly something worth bearing in mind for future sessions. The fish sit in patches, if you find a match, record exactly where it is, so you can return to it the next time. It is good to hear reports of Black Bream being caught from the beach. Judging by some of the pictures I have seen from the boats over the past couple of weeks, it looks like me might be in for a great year for Bream. It is certainly going to be helped by the trawling ban, implemented within the new marine conservation zone at the eastern end of Chesil. Water temperatures are nearing the magic 11°c. mark. It is regarded by the good Bass fishermen as the trigger point for the Bass to move inshore in search of Peeler Crabs and bait fish. I have only heard of a couple of Bass in this area, but I know that some of the Devon and Cornwall marks are starting to produce. It looks like I will have to dust my Bass lures down this week. 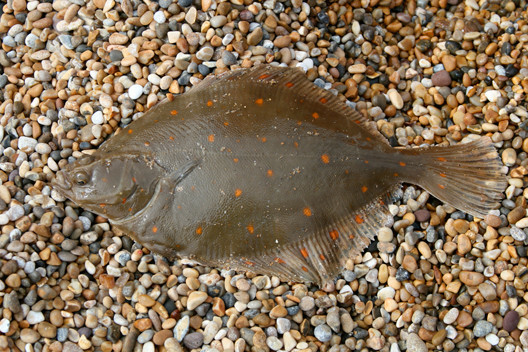 Chesil Beach forecast: With small tides for the next couple of days the Plaice fishing will be slow at times. However the smaller tides allow you to use smaller plain leads and try and search out the holding spots. Use the smallest weight you can get away with. Choose one that will roll gently in the tide, this allows it to fall into depressions that often hold fish. Using Flurocarbon hook lengths can give you the edge when the tide flow is slower and the fish have more time to inspect the bait. Flurocarbon line is supposed to be invisible under water. Mackerel and Herring should move in close to the shore, especially after 6pm, when the sun is lower in the sky. Night sessions will produce Dogfish and Pout. Portland: The Wrasse fishing is in full swing on Portland, with reports of some big bags of 4lb plus fish caught on bait. I had a walk around Portland Bill at the weekend and talked to quite a few anglers. Those fishing in the right place did very well. You have to fish the right side of the Island at the right time of tide. On the Ebb tide the fishing is better for Wrasse on the West side, and during the flood you are far better of fishing the East side. For Pollock and Bass it is the reverse. It was good to see a few anglers fishing with lures. 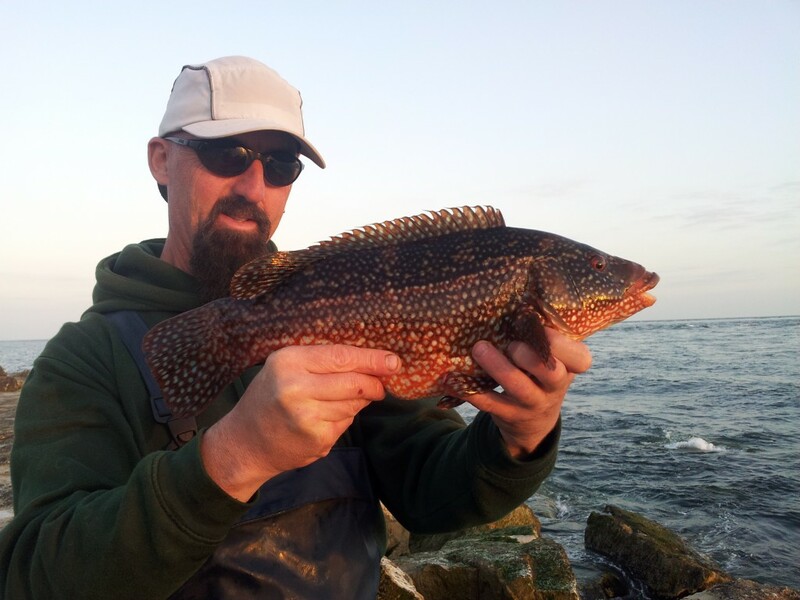 John Cady had this lovely Wrasse on a Fiiish Black Minnow. Portland Harbour: This is where I expect the first of the Bass to come from, and to be honest I can’t wait. You can lure or bait fish for them, but I have always found that lure fishing for them is more successful and a lot more fun. Especially if you are using surface lures, where you can see a dramatic explosion of water as the Bass hits the lure on top of the water. I will give more details of which are the best lures in the next week. Weymouth Bay: Still waiting for the Mullet, but the piers are fishing well. Wrasse, Pollock, Pout and even Mackerel are being caught from the piers. They are normally smaller fish but if you are introducing kids to fishing then you can’t go wrong. Keep it simple, a single hook running ledger is ideal. Bait it with some Ragworm or a bit of Mackerel. If you want something a bit more visual, then set up a float with a strip of Mackerel and you might get a pleasant surprise, as the Pollock that are around at the moment are pretty big. 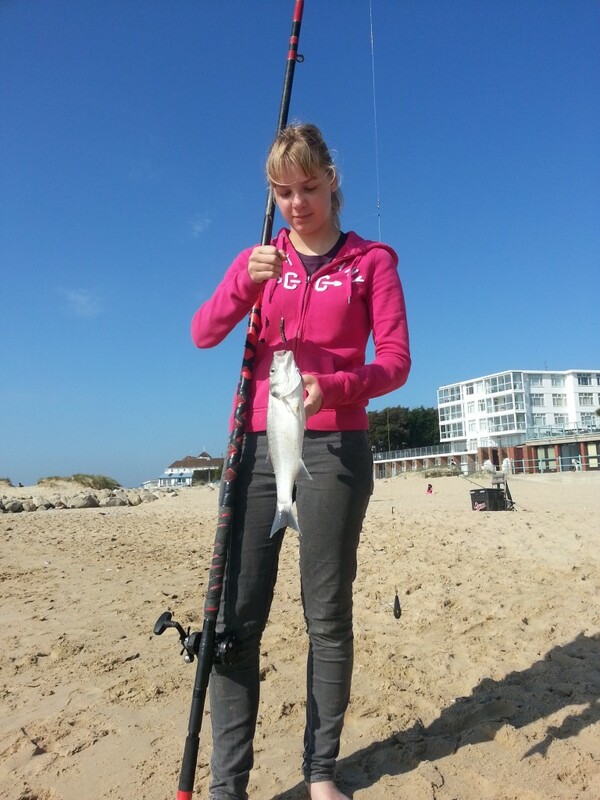 Poole: A few small Bass starting to show in Poole harbour, along with plenty of Flounder. 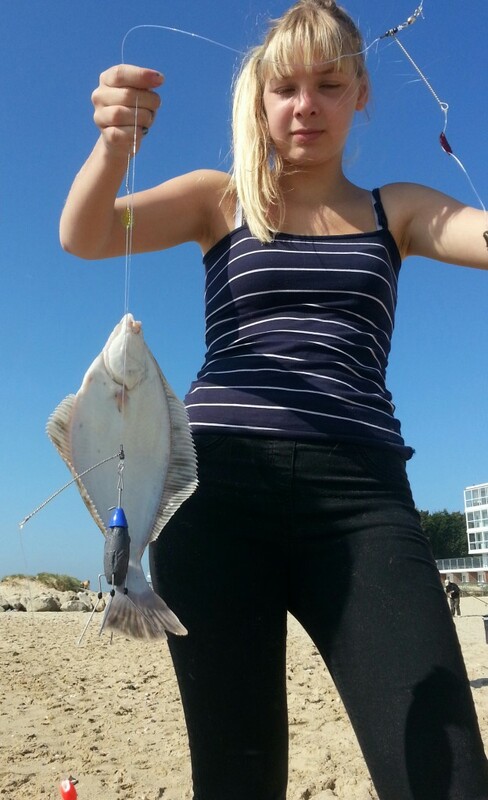 Regular contributor Leo had another attempt at some Plaice at Sandbanks with his daughters. He didn’t find any Plaice, but his daughters managed a Bass and Flounder between them.